How might the contributions from a particular civilization not only shape their own history but the world as a whole? That is the essential question we wanted our students to ponder while creating interactive timelines using the online tool Timeline JS. 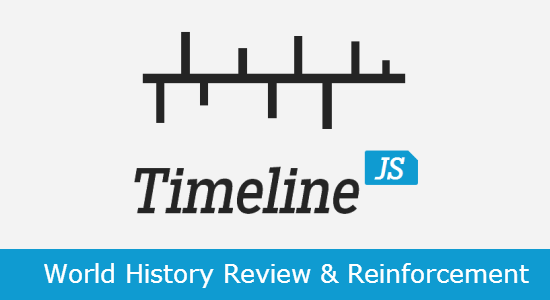 Timeline JS is an open – source tool that creates visually rich, interactive timelines. The program has the capability pull student research data directly from a Google Sheet and transform that information to a beautiful timeline. Students were responsible for researching World History events that were discussed during the first semester. Working in self selected groups students used research and information fluency skills to add learned and newly acquired information to a shared Google Sheet. Information in the sheet contained, but was not limited to headlines, event descriptions, important dates, images, video, and other multi-media options. Once the final timelines were created, students shared their work with their peers in a Google Site. Approaching: The students used modern tools when researching their time periods. The teachers modeled various online research tools as well as advanced Google research options to assist students with their research. The digital tool used to create a the final timeline utilized push/pull technologies to powerfully display student research finding and hereby allowing visitors to their Google Site and interact with the information. Ideal: The students used a Google sheet in order to work in their self – selected groups. Google Sheets allowed for appropriate real time collaboration between group members. Students were able to work collaboratively and house all of their information within a single spreadsheet. Students could get feedback using suggested edits prior to publishing their sheet to Timeline JS. Once the spreadsheet was complete, students utilized the Timeline JS website to create an aesthetically appealing website that was embedded within a Google Site. This site is public on the web and has been shared outside the traditional classroom walls. Once the Google Site was linked to the timeline students were still able to make changes to the database and have the changes reflect on the site in near real time. The end – product of the site provided World History classes in other schools to use the student created timelines as study guides prior to Semester benchmarks.